Successfully Added Quad Band Dual SIM Cellphone - 3 Inch Touch Screen Motion Mobile to your Shopping Cart. Four band GSM dual SIM cellphone with 3.0 inch touchscreen for worldwide use. This modern unlocked digital mobilephone is a quad-band (850MHz, 900MHz, 1800MHz, 1900MHz) GSM/GPRS worldwide use phone with two SIM card slots (Dual SIM with dual standby) allowing you to have two active numbers within the same mobile. In addition, this model has plenty of easy to use multimedia tools and productivity features. The signature functions include; messaging with touch screen and handwriting functions, modern phonebook + contact manager, easy to use keypad, Bluetooth with A2DP + AVRCP, and feature enhanced software tools to help you keep ahead of your busy life. This model mobile phone is in stock now and available for single sample or bulk orders. Order your stock now and don't forget to check our Bluetooth accessory category to see all the latest in speakers and earpieces. 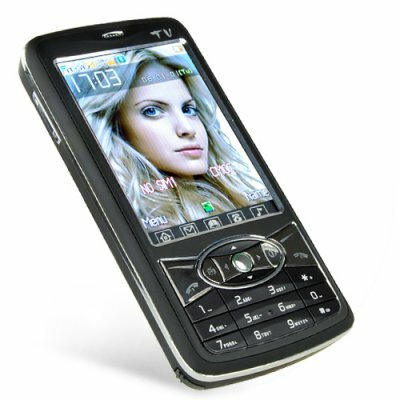 Unlocked quad-band touchscreen cell phone with two SIM slots, Bluetooth, and easy to use keypad. Multi-color LED keypad and vibration options for incoming messages, calls, and music playback. NOTE: (1) This product is compatible with GSM at the four frequencies of 850MHz, 900MHz, 1800MHz, 1900MHz. This can be used throughout the world. (2) The second SIM card slot will not register properly with your carrier if you live in Ireland, Sweden or the Netherlands. Both SIM card slots will work fine in all other countries in the world. But if you live in these two particular regions we suggest you choose another mobile phone model with dual SIM card slots. Produto muito fácil de operar e muito bonito. pega muito bem no Brasil -RJ. this phone looks so cool and by the looks of these reviews i cant wait for it to arrive tomorrow! This is an ecellent mobile phone, I will order more of them. I highly reconmend to anybody out there. my friends loved it. on 2009-06-19 13:46:51 Excellent phone! Hi quality phone, good value for your money, highly recommended! THANKYOU!! !